As the U.N. climate change conference in Poznan draws to a conclusion, the EDF team has been scrambling to get copies of the final texts of agreements and analyzing results. The EDF team plots strategy outside its cubicle in the Poznan convention center. However, EDF said the overall results of the Poznan talks were “merely adequate” and called on world leaders to work harder to reach a shared agreement to stop global warming before temperatures rise 2ºC. 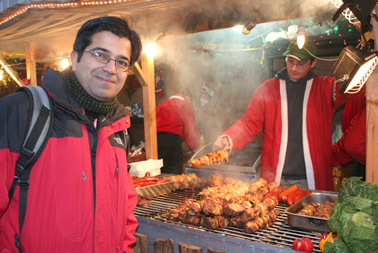 Richie Ahuja, EDF’s India project director, escapes the convention center to sample local fare in the old town square of Poznan. This entry was posted in Poznan. Bookmark the permalink. Trackbacks are closed, but you can post a comment. My take on Poznan is that it delivered much less than the “bare minimum” needed, and was light years below “merely adequate”. The UN adaption fund established by the “developed” nations to assist hundreds of millions of people in developing countries threatened by rising seas is expected to deliver 200-300 million dollars, while, according to an Oxfam rep at Poznan, the needs are estimated at 50-80 billion. One half of one percent of what’s needed to keep people from drowning is not a minimum but an insult. It’s even more of an insult compared with the 700 billion established by the U.S. to bail out its banks.